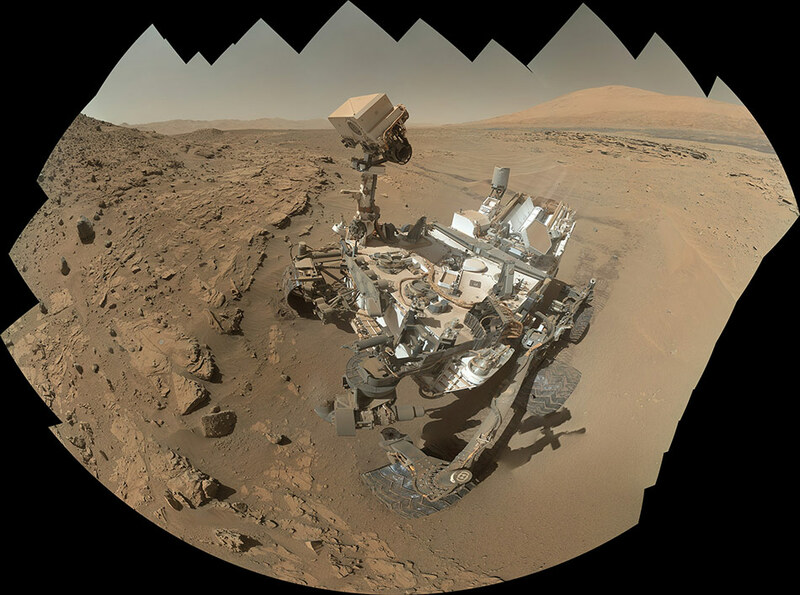 NASA’s Curiosity rover has explored Gale Crater for 833 Martian days, or Sols. And it has found evidence, written in red rocks and sand, of lakes and streams on a warmer, wetter, habitable Mars. 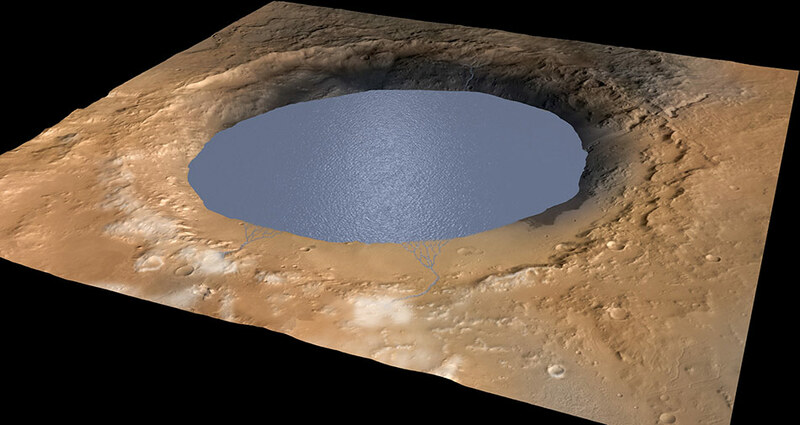 Gale Crater as it might have appeared several billion years ago. Snow on the crater’s rim fed rivers and deltas flowing into the lake. The moving water carried sediment and carved patterns in the sand of the lakebed, leaving traces in the rocks that Curiosity is now driving over. The water was not too salty or too acidic, and could have supported microbial life. The Curiosity rover touches down after an intricate, seven-minute landing sequence. 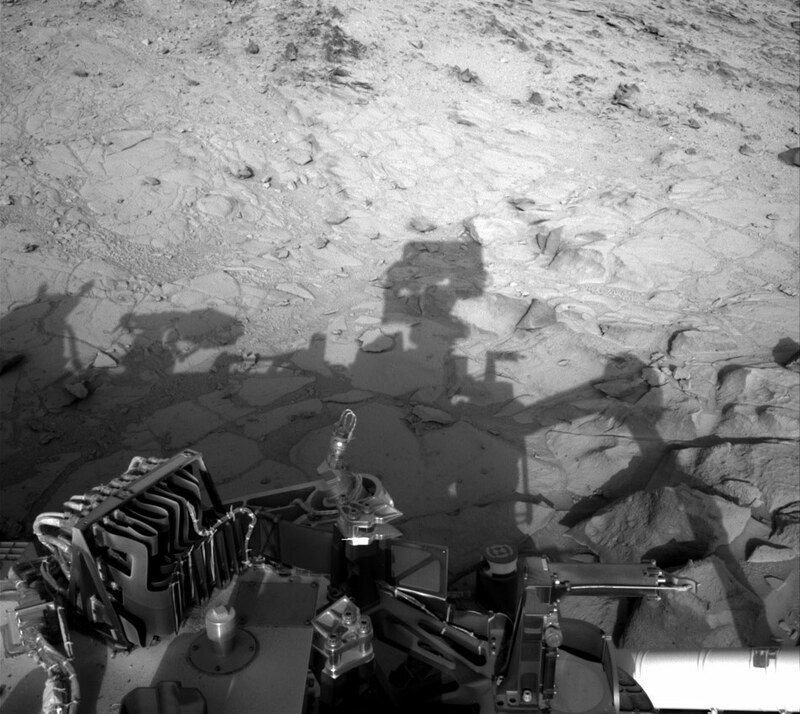 The first images returned from the martian surface show the rover’s shadow stretching toward the bright slopes of Mount Sharp. After spending two weeks testing its instruments, Curiosity makes its first drive and leaves its rocket-scorched landing site. 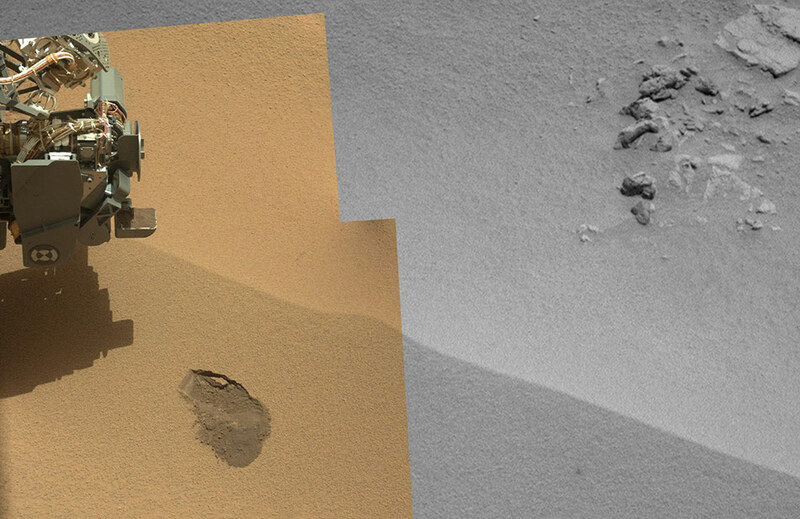 Curiosity’s arm scoops its first sample of Martian soil, leaving a dark mark in a dune named Rocknest. The rover spends six weeks at the Rocknest dune, studying the composition of the crater’s wind blown sand. 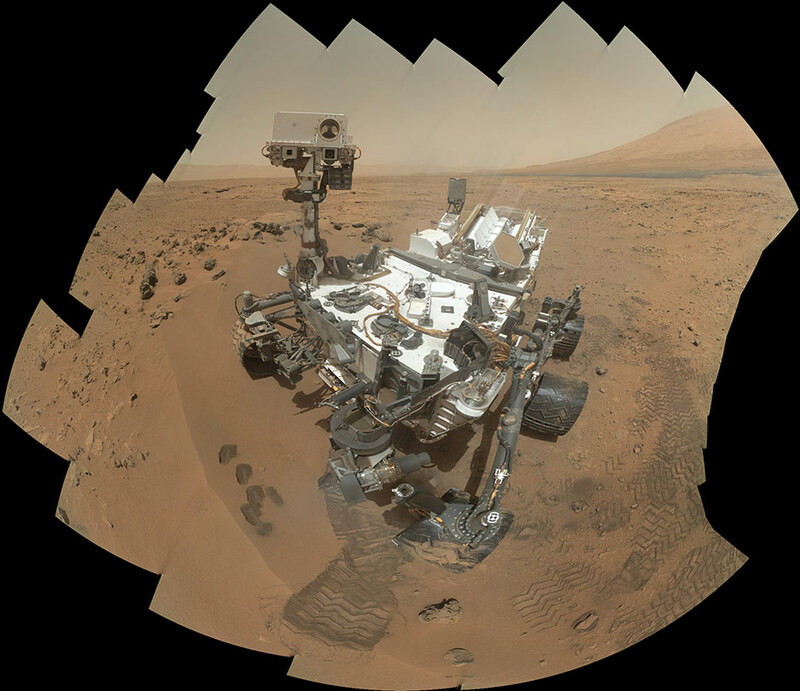 Curiosity spent most of its first Earth year on Mars in a broad, shallow basin called Yellowknife Bay. The rover drilled holes and took samples of low-lying mudstone, which formed from ancient lake and stream sediment. The rover examines a patch of mudstone on the floor of Yellowknife Bay for a suitable spot to drill. 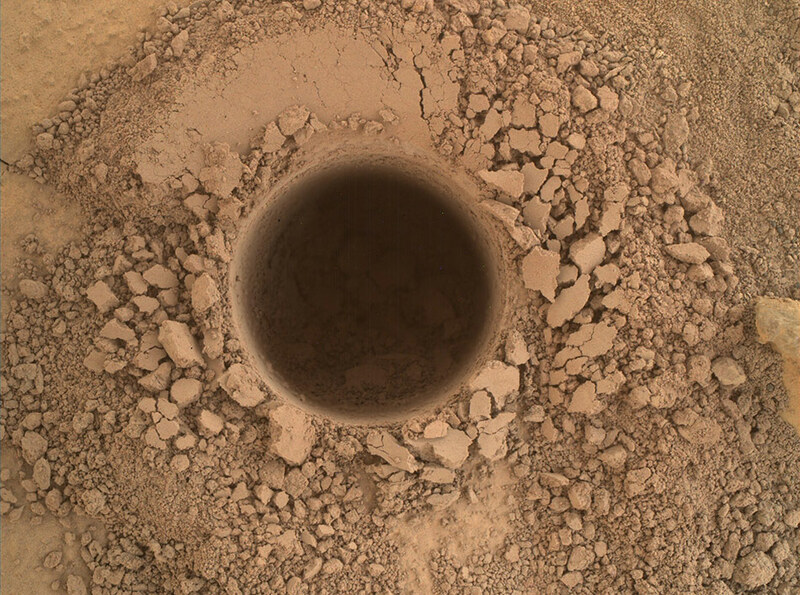 Curiosity was the first rover to drill a hole in another planet and extract a sample. A suite of chemistry experiments in the rover analyze the rock, which formed billions of years ago from lake sediments. 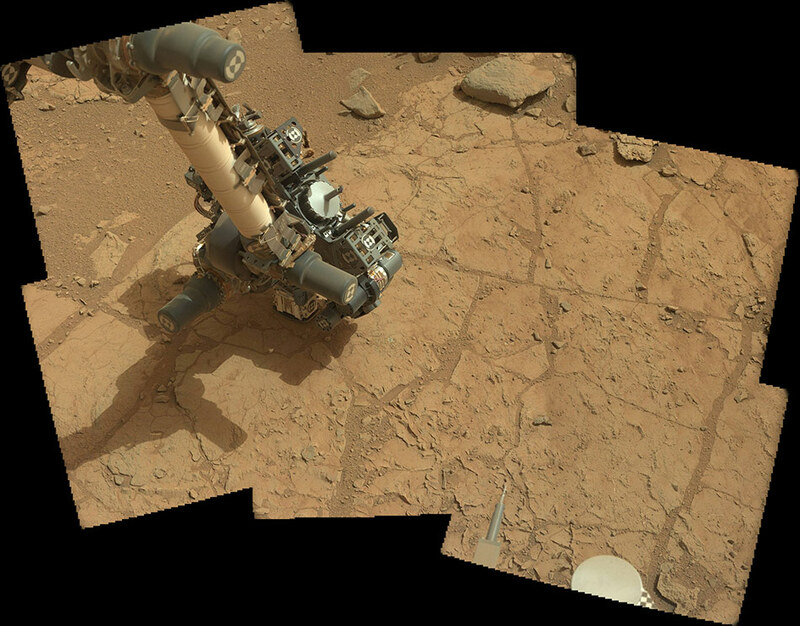 Curiosity’s extended arm drills a second hole in Yellowknife Bay, extracting samples from a flat mudstone site named Cumberland. Curiosity begins driving toward its destination at the base of Mount Sharp, after almost a full Earth year studying the terrain near the landing site. 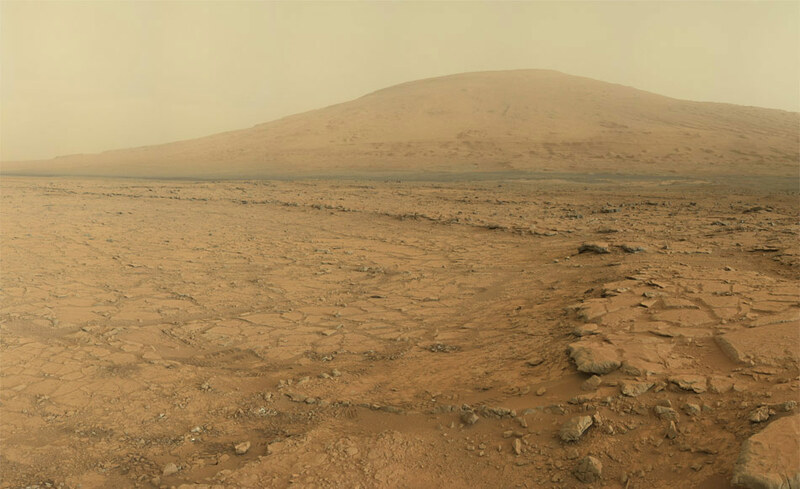 The rover’s first waypoint on its long drive to Mount Sharp is an outcrop called Darwin, an exposed patch of the bedrock underlying Gale Crater. Curiosity briefly studies the rock for evidence of past flowing water. 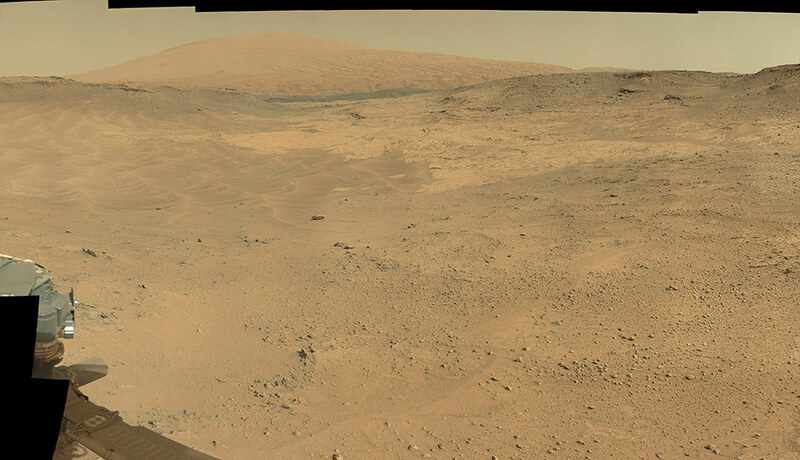 Curiosity pauses at its second waypoint, a scarp named Cooperstown. The rover spends a week downloading, installing and unexpectedly troubleshooting a software update from Earth. 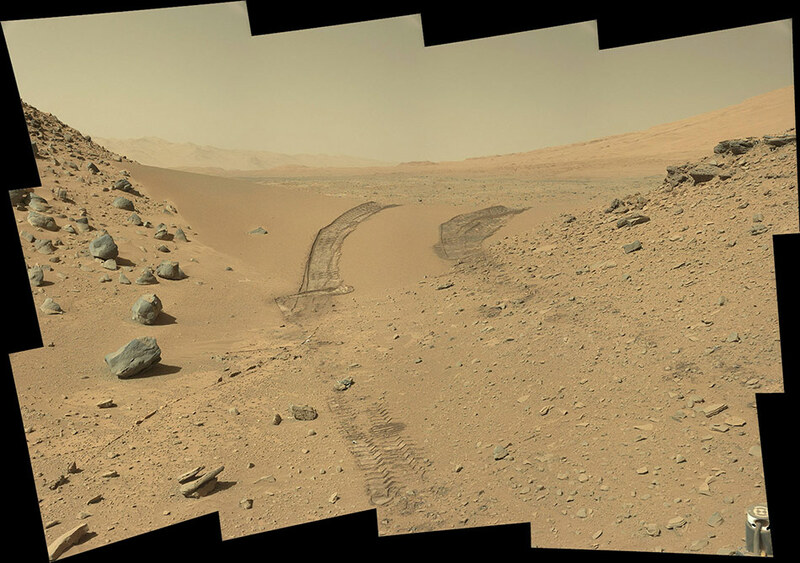 Curiosity looks back after driving over an elegant crescent-shaped dune spanning a narrow valley pass. Curiosity examines the Kimberley, a large outcrop of layered sandstone slabs tilted toward Mount Sharp. The outcrop supports the idea that layers of lake and stream sediment accumulated in Gale Crater over millions of years. 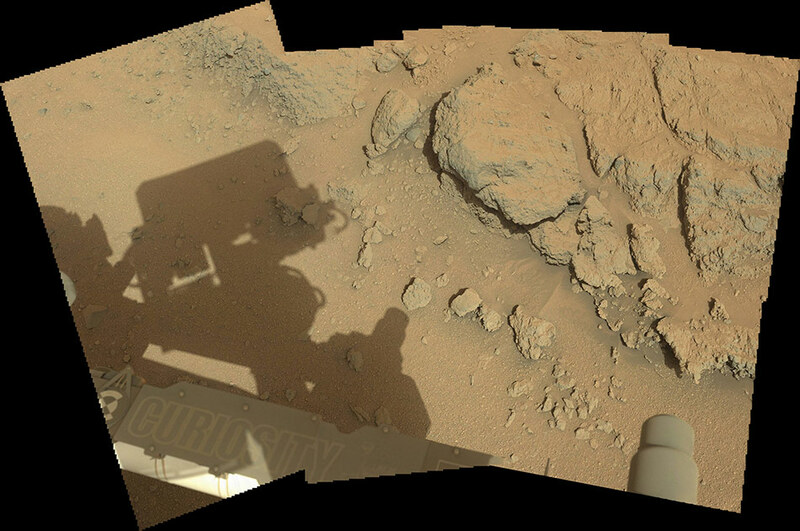 Curiosity takes a self portrait near the end of its two-month exploration of the Kimberley outcrop. The rover is looking down at Windjana, a sandstone slab it drilled into eight days later. 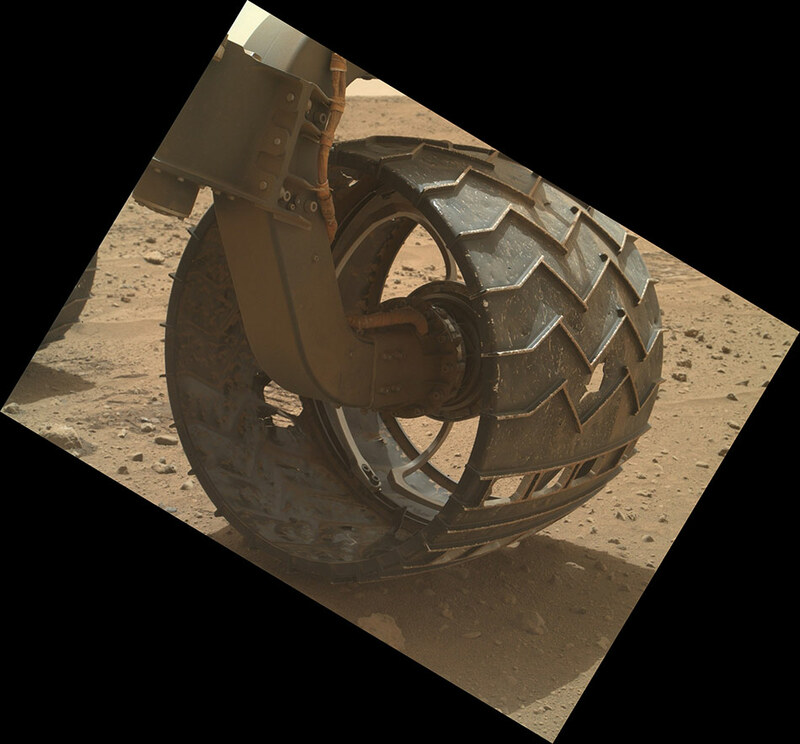 The rover’s aluminum wheels have been heavily torn by driving five miles across the rough terrain of Gale Crater. To limit further damage, the rover has tried choosing paths over softer ground and sometimes driving in reverse. 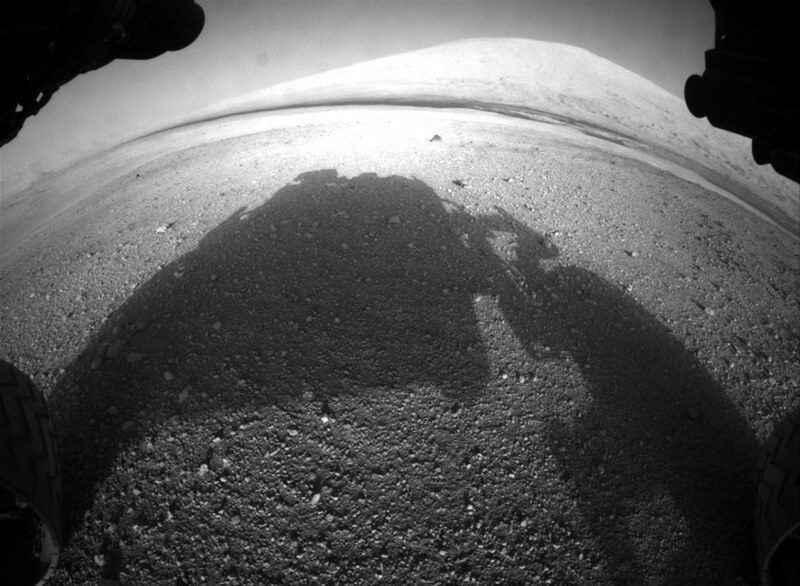 Curiosity ends its second Earth year on Mars with its wheels deep in soft sand. 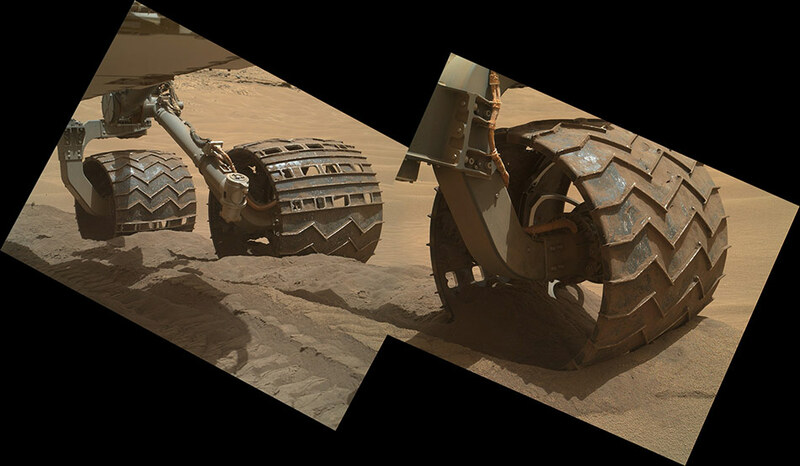 Mission planners had hoped to drive across the rippled sand of Hidden Valley to protect the rover’s battered wheels, but decide to back out and stick to harder ground. 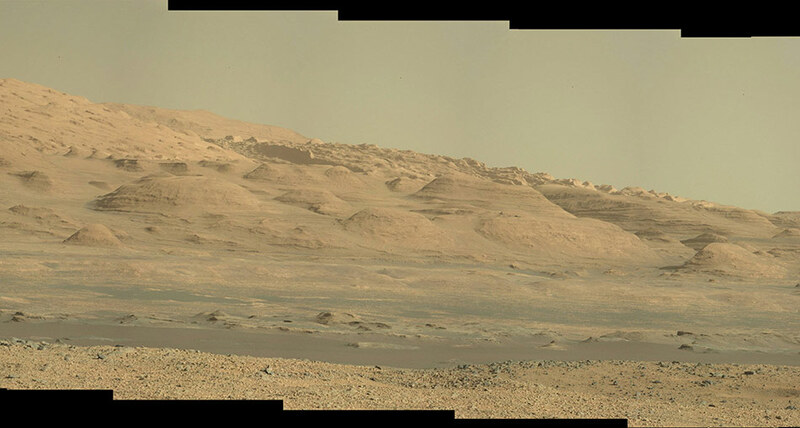 Curiosity reaches the Pahrump Hills, a pale outcrop of rock that is part of the base of Mount Sharp. The dark rippled areas are windblown drifts of sand and dust covering the flat bright rocks of the Pahrump Hills outcrop. 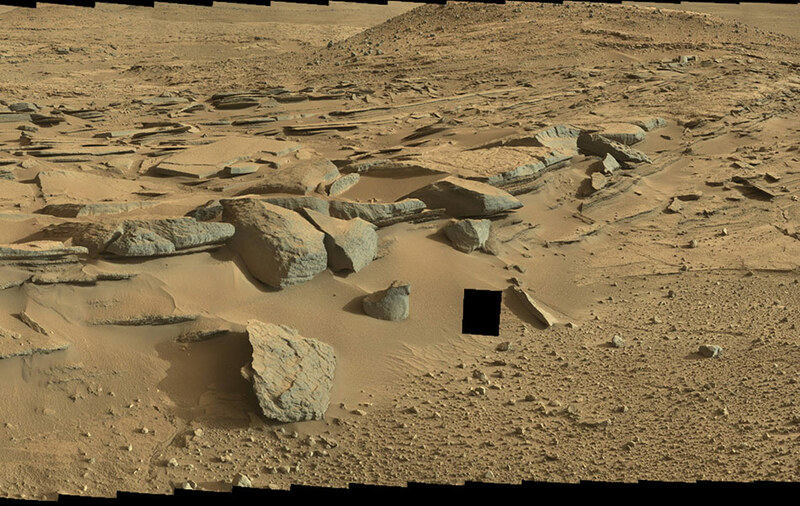 Curiosity drills a hole in the Pahrump Hills outcrop. This is the rover’s first chance to sample rock from the base of Mount Sharp. Previous drill sites were rocks from the plain surrounding the mountain. Curiosity cleans red dust from a patch of Martian rock named Mojave, part of the Pahrump Hills outcrop. Scattered through the rock are rice-shaped crystals of salt, which likely formed when an ancient lake or stream dried out. 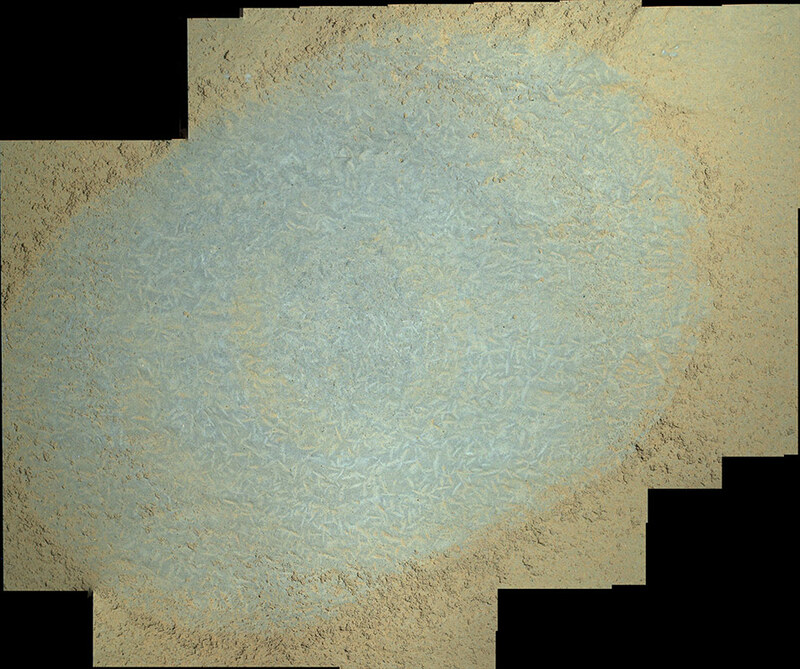 The crystals hint at a cycle of dry and wet conditions in the distant past of Gale Crater. In its 11th week at Pahrump Hills, Curiosity is making a second loop around the pale stones of the outcrop, brushing dust from the most interesting rocks and looking for a suitable place to drill. Curiosity has driven six miles since leaving its landing site. Soon the rover will begin climbing Mount Sharp, picking its way through buttes striped with layers that record the geological history of Gale Crater and the changing Martian environment. See the full article, with animations, here.